The Ocean/Jungle Large structure is a ship on one side and a tropical jungle for exploring on the other. 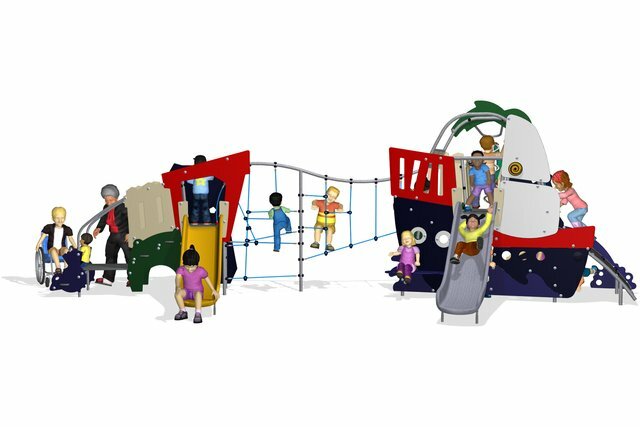 In the jungle children will find a hidden snake, a climbing wall, a vertical play panel and a play counter where children will gather. A three dimensional climbing net links the jungle and the ship to a satellite tower giving more play opportunities. The journey starts at the satellite tower with a slide and continues with a challenging climb across the linking net to the main tower. Climbing is a fundamental loco-motor skill that involves an ascending and descending movement using the hands and feet. The complexity of the climbing net will create a variety of movement patterns and is a great social gathering space, as well as a place for developing their movement skills when passing each other. Once back safely in the ship, children can choose to slide down into the water or take a swirling descent down the curly climber and into the jungle.